The USS ACADIA (AD-42), a Yellowstone-class destroyer tender, was commissioned on 6 JUN 1981. Built by the National Steel and Shipbuilding of San Diego, USS ACADIA was homeported in San Diego after commissioning. ACADIA was commissioned into the era of standing US Naval presence in the Persian gulf. ACADIA repeatedly deployed through the Western Pacific and on into the Indian Ocean. In May 1987 she repaired the USS STARK after taking a missile strike from an Iraqi fighter. ACADIA was on hand for Operation Desert Shield and Desert Storm and repaired the mine damage of USS PRINCETON (CG-59). USS ACADIA served her country for 13 years, 6 months and 10 days, until decommissioned on 16 DEC 1994. The hulk of the ACADIA was disposed of during a Fleet SINKEX off Guam in September 2010. Acadia (AD-42) was laid down on 14 February 1978 at San Diego Calif. by the National Steel and Shipbuilding Co.; launched on 28 July 1979; sponsored by Mrs. Clarence R. Bryan the wife of Vice-Admiral Clarence R. Bryan Commander Naval Sea Systems Command; and commissioned on 6 June 1981 Capt. Brenton P. Hardy in command. Acadia completed her outfitting at her builders yard on 6 July and then made the brief trip to the Naval Station San Diego. After a month clearing details and getting ready the destroyer tender embarked upon her shakedown cruise on 7 August. That voyage took her to Pearl Harbor Hawaii and back to San Diego where she arrived on 28 August. When the ship returned to her home port her crew concentrated their efforts on honing their skills as repairmen; and except for a few brief periods at sea for underway training and propulsion plant certification Acadia spent the rest of the year in port at San Diego. The destroyer tender began 1982 as a fully operational mobile repair facility of the Pacific Fleet. She provided her services at San Diego until the beginning of February when she moved to Naval Air Station Alameda. At the end of the month she steamed back to San Diego. Late in May the ship embarked Naval Academy and NROTC midshipmen for their summer training cruise. On 14 June Acadia stood out of San Diego on her way to Hawaii. The destroyer tender repaired ships of the Pacific Fleet at Pearl Harbor from 22 June to 25 July. Returning to San Diego in August she spent the remainder of the year in the immediate vicinity of her home port. Though she put to sea occasionally for training purposes the majority of the time she was in San Diego doing repair work for the fleet. In December 1982 Acadia began preparations for the first overseas assignment of her career. On 4 January 1983 the destroyer tender put to sea for a journey that took her not only to the Orient but into the Indian Ocean and to the east coast of Africa as well. Acadia stopped at Pearl Harbor between the 12th and the 14th and after another 10 days at sea arrived in Yokosuka Japan on the 24th. Acadia remained in Yokosuka for almost a month then visited Sasebo before setting a course for the Philippines on 23 February. The ship entered Subic Bay Luzon on 27 February and performed repairs until 3 March when she put to sea for duty in the Indian Ocean. She reached the American outpost on Diego Garcia Island on 13 March and worked at that location for 16 days. On the 29th Acadia headed for the east coast of Africa. She visited Mombasa Kenya from 4 to 11 April; called at Mogadishu the capital of Somalia between the 13th and the 16th; and paused overnight at Al Masirah an island off the coast of Oman near the Horn of Africa on 22 and 23 April. The destroyer tender returned to the base at Diego Garcia on 29 April and spent the next month there repairing warships on duty in the troubled waters of the Arabian Sea and the Persian Gulf. On 2 June 1983 Acadia departed Diego Garcia on her way to Pattaya Thailand. The ship arrived at Pattaya on 11 June. For the rest of the deployment she operated in the Far Eastern waters proper. From Pattaya she steamed back to Subic Bay where she provided repair services to ships of the 7th Fleet during the latter part of June. During July Acadia called at Hong Kong Pusan in Korea and at Sasebo Japan. On 16 July the destroyer tender stood out of Sasebo on her way back to the United States. She took the usual break in the transpacific voyage at Pearl Harbor between the 27th and the 29th and reentered San Diego harbor on 4 August. Acadia remained at San Diego for about two months after her return from the Orient. Post-deployment standdown consumed the first month but she got back to work providing repair services during the second. Near the middle of October the destroyer tender voyaged north to Bremerton Wash. where she carried on her duties until 4 November. Returning south by way of San Francisco Acadia reached San Diego again on 12 November. She resumed repair work at San Diego upon her return and remained so occupied through the end of 1983 and well into 1984. In fact the ship did not get underway again until late in March 1984 when she put to sea for three days in the southern California operating area. She returned to port on 23 March and resumed repair work until June. During the week of 11 to 18 June Acadia made the round-trip to Monterey and back. In July she participated in a midshipman summer training cruise and in August carried out refresher training in the local operating area. During the remaining months of 1984 the destroyer tender concentrated on repair work and preparations for her second deployment overseas. Acadia embarked upon the voyage to the Far East on 5 January 1985. She stopped in Pearl Harbor from the 12th to the 14th and then resumed her journey west. Steaming by way of Guam the destroyer tender arrived in Subic Bay on 2 February. She conducted repairs there for about a week and voyaged to Hong Kong for a port visit. The ship returned to Subic Bay during the latter part of February and stayed there until 8 March. At that time she headed for Japan. During March she called at Sasebo and at the Korean ports of Pusan and Chinhae. On the 28th the tender returned to Japan at Yokosuka. Acadia spent the remainder of her tour of duty with the 7th Fleet at Yokosuka carrying out an extremely heavy schedule of repairs on warships assigned to that fleet. On 12 June she set out upon the voyage home. Acadia stopped at Pearl Harbor as usual and pulled into San Diego on 3 July. After a month of leave and upkeep the destroyer tender began preparations for her first regular overhaul. On 16 September she moved to the yard of South West Marine in San Diego where she underwent repairs until mid-December. Holiday leave and upkeep occupied the last half of December 1985 but Acadia launched into a full schedule of repair services in January 1986. Except for occasional brief periods at sea and a port visit to San Francisco in June she remained at San Diego until September. Early in the month she put to sea for refresher training and on the 28th embarked upon the passage to Alameda. Acadia arrived at the Naval Air Station Alameda on 1 October and began a busy six weeks of repair work there. The destroyer tender returned to San Diego in the middle of November and spent the remainder of 1986 in preparations for overseas movement. Although originally slated to deploy in January 1987 Acadia provided repair services to ships in the San Diego area into the spring. On 14 April the tender sailed for the western Pacific and after touching at Pearl Harbor (21-22 April) and Subic Bay (8-18 May) was en route to Diego Garcia when she was rerouted to the Persian Gulf. An Iraqi Mirage F.1 had mistakenly attacked and severely damaged the guided missile frigate Stark (FFG-31) on 17 May 1987. The crippled ship had limped into Bahrain where Acadia was dispatched soon thereafter. 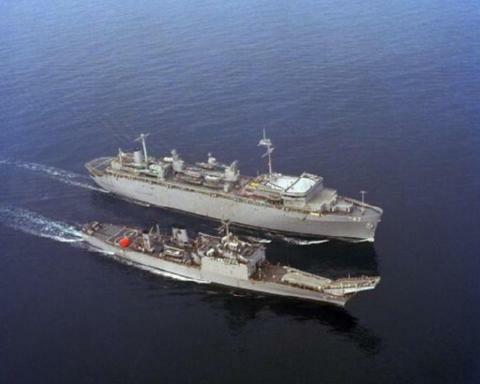 Between 1 and 27 June Acadia provided berthing messing and repair services to Stark "doing what she (Acadia) was designed to do providing forward deployed support and battle damage repair ...."